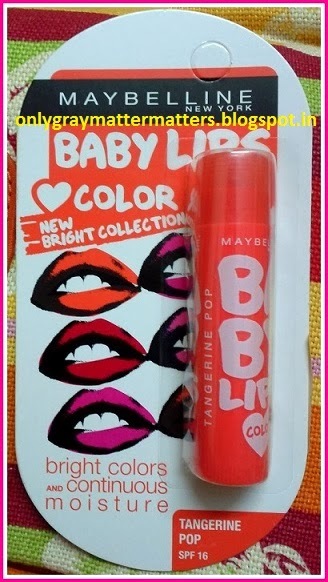 Maybelline has just launched 3 new bright colors in its raved and famous Baby Lips lip balm collection. 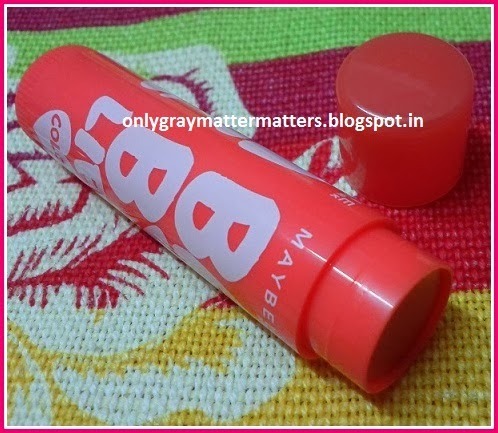 This is a review of the shade Tangerine Pop from the newly launched 'New Bright Collection' of Maybelline Baby Lips. Don't go by the name 'bright' or you will be disappointed because Tangerine Pop is a gorgeous soft peachy orange shade, nowhere near to 'bright'. It is a translucent lip balm. It looks like you have applied lip gloss but it is totally non-sticky. 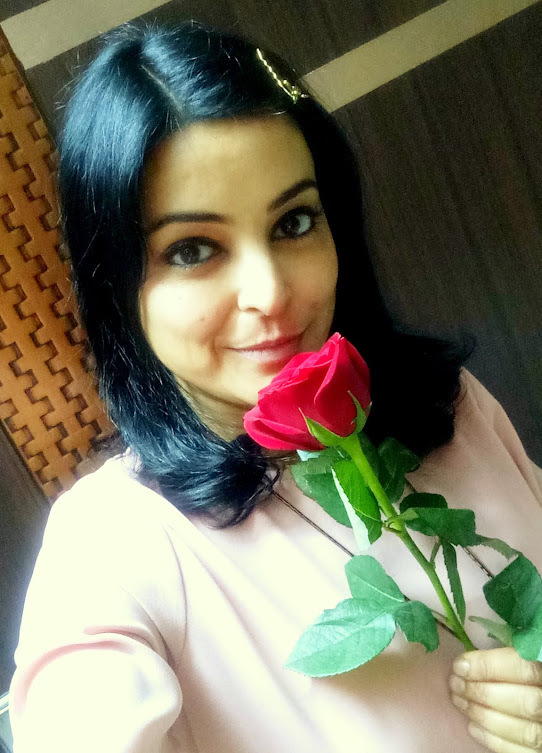 It gives a healthy peach glow to lips making them look natural and full. You can buy it from HERE. 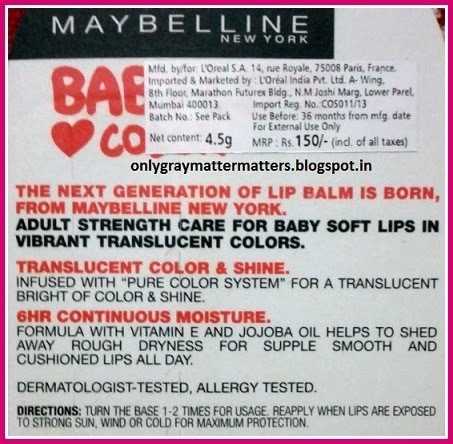 The previous range of Maybelline Baby Lips had 7 flavors (5 colored and 2 transparent). I was about to finish my Maybelline Baby Lips Antioxidant Berry and while re-ordering, I noticed these new shades. The previous range was made in China and these ones are made in Thailand. The previous ones had opaque caps and these have translucent caps. Each colored Maybelline Lip Balm comes in a matching pack/container. 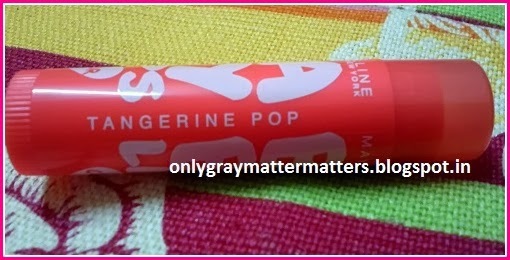 Maybelline Tangerine Pop has a fruity bubblegum flavor. The taste goes away within a minute. 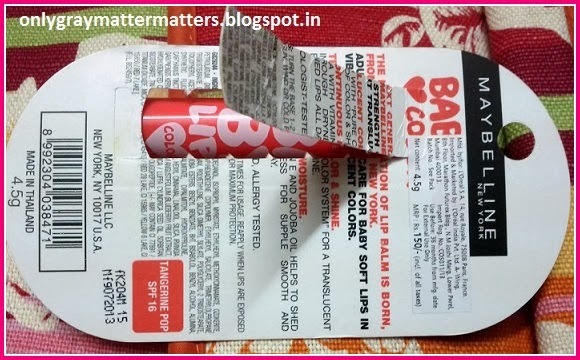 The fragrance is VERY light and it does not irritate my throat like the Antioxidant Berry Babylips used to do initially. This is my first colored lip balm so I was not sure how bright or how sheer the color is. Like all other colored variations of Baby Lips, this too has SPF 16 and claims to keep lips hydrated for at least 6 hours. 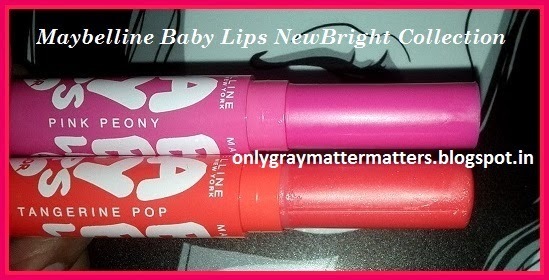 The transparent Babylips flavors have SPF 20 with 8hr hydration claim. So I was apprehensive that this colored balm might not be as hydrating as the transparent one (antioxidant berry) I had tried earlier. But rather this Tangerine Pop colored lip balm works as good as the transparent ones. It keeps my lips hydrated for 3-4 hours. The 6 hours hydration claim may be true for summers and other seasons. 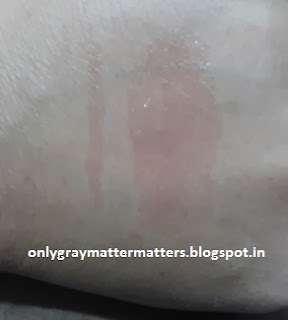 It completely heals severely damaged lips within 2 days and even removes any tanning or pigmentation that had been there. The outline of my lips had become a bit dark but now it is back to pink within a few days. On healthy or slightly chapped lips it stays a good 3 hours at least, without eating. After eating, the balm is gone but lips are still soft for another hour or so. A hint of peach color is left on the lips but that does not look odd or unnatural. 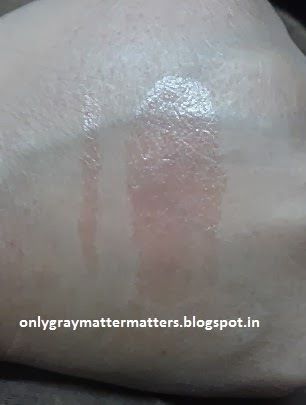 If you apply liberally, the color shows/bleeds a little at the edges of lips and can be wiped off easily with finger. 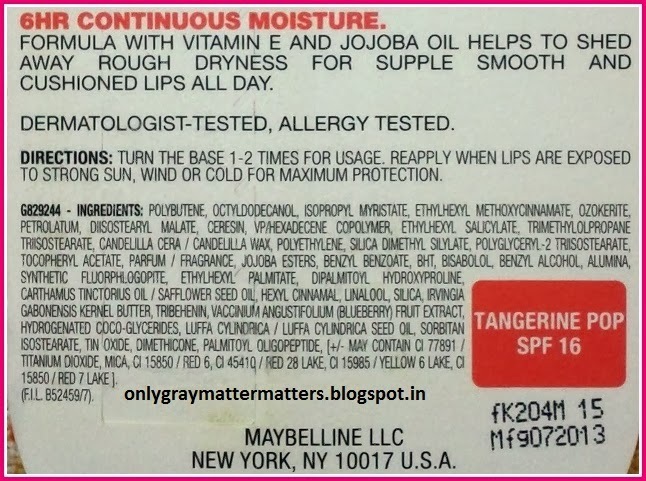 If you apply liberally on very chapped lips, the color gets trapped under the damaged skin and shows a little. But as the color is sheer, even that does not look bad or attention catching. I like Maybelline baby lips mainly because they actually hydrate my lips and keep them healthy. I love that this has sun protection too. It is very convenient to use and carry as the packing comes in a hygienic lipstick-like twist up stick. The cap is sufficiently tight and does not get off on its own. Before I started using Maybelline Baby Lips lip balms, my lips used to be ALWAYS chapped so much so that my son had pointed it out when it pricked him while kissing his cheeks. And when this healed my lips, he was surprised and asked how did my lips become soft. No doubt I love these. The previous one lasted me 5.5 months. Being winters, this may last a little less. 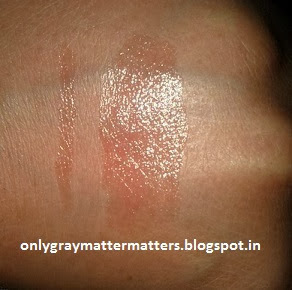 I am in love with this shade, it's like a blush for the lips and even guys can carry this shade. 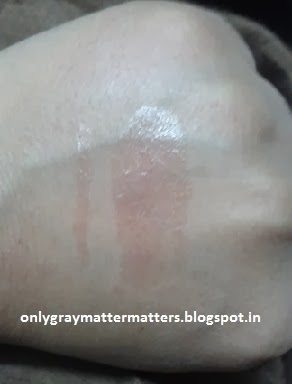 Here are some swatches in different lighting. Left is single swipe, right is multiple swipes. These colored lip balms are also a great choice for college students who want a touch of glamor without looking made up. 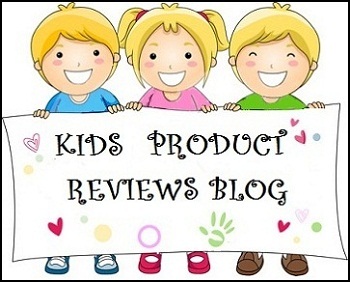 I will review Pink Peony shortly. So which is your favorite lip balm? Yes these are yummy and tangerine pop is a gorgeous shade. Now these are showing up on a few more sites too recently. You can check amazon.in too or just google for more options. Wow, the lemon lavender one sounds so tempting. I am gonna make some of my own with beeswax. I wish I could find good quality twist up containers. baby lips is a hit for me :) works great for chapped lips in this weather.